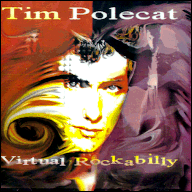 Futuristic Rockabilly from the singer of The Polecats. This continues from where 'Make a circuit with me' left off, and shows Tim Polecat to be probably the most innovative member of the band. This cd has covers of songs from Phil Lynott and Grandmaster Flash! Take the Polecat sound and boost it into the year 2300. Here is someone trying to take rockabilly into the future. The fourteen tracks rock with lots of echo and special effects. Hey, people laughed at Esquivel once. Call out tracks: The Boys Are Back In Town (yeah, that one), the rolling Panic and the cover of Head On. Weird, but important. Thunder and lightnin (Wolfe) Le Bill Music Tornado (Anderson/Hedges) Cop. Cont.